This is super cute. My kids would love it. 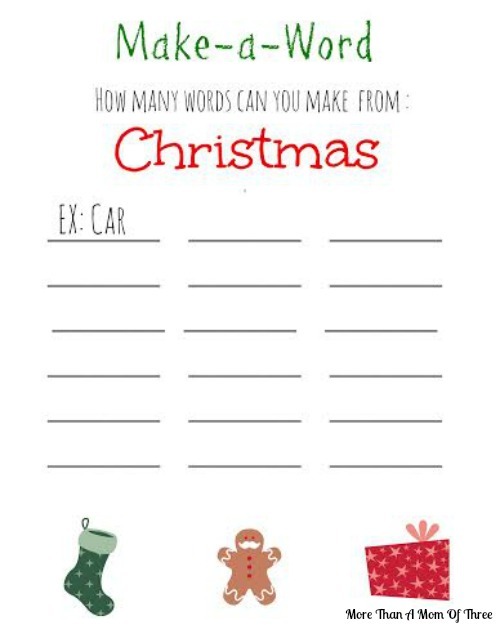 You always have such cute printables. I love activity sheets! This looks like a fun Christmas themed one. This is a great freebie and would be perfect for classroom parties! What a cute way to encourage word building with kids. I love it. This is so cute! I’m pinning this for next year! I love doing activities such as this! I would love to do a Christmas version of this! That was absolutely one of my most favorite things to do as a child. I always won the candy from the teacher when we did that in class, lol. I was good at it! Thanks for this printable. My nieces and nephew need something creative to do during the holidays. We’ll see if I can figure out more words than them. This looks like a great idea – my niece would love this activity! Krista recently posted…Join Me at the #Keurig400 Twitter Party!